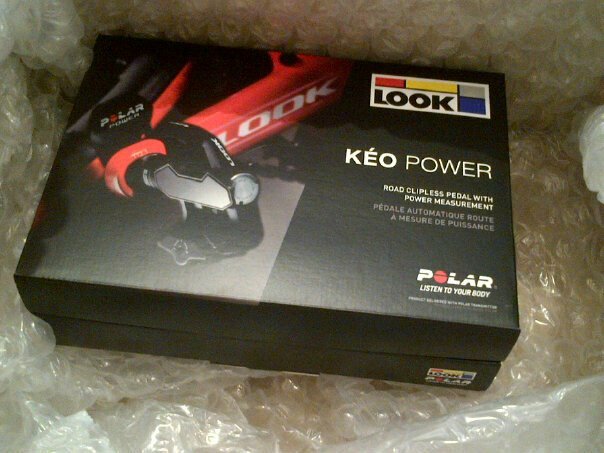 View through the Shop Window: LOOK Polar Power ! I've been busy with work, family and getting fitter since I last updated this. Part of my getting fitter plan has been to train smarter and make proper use of the tools that are available to me. Last season I made great progress in my swim, this year the plan is to make a significant dent in my bike weaknesses. To do this I have to first work out what my strengths and weaknesses are. I don't think there is a point in just knowing what these are; I know I'm not a good climber, I know I'm not a great sprinter, I'm OK at time trialling, I'm OK at long events; I want to clearly identify where? what? and why? I'm strong or weak and to work on how to make changes. Enter the Look Keo Power. Why not SRAM, Powertap, Garmin Vector? I'm a Polar man. Polar has never let me down. Everything they have done, is done right. Yes, they had a Power Meter a few years ago that didn't get great reviews. (It worked on harmonics from chain vibrations, I believe) but I think people mis-understand the purpose, it was an attainable power meter to help 'casual' cyclists become better cyclists. It wasn't a Pro piece of kit and wasn't priced as such. Anyway, I've ordered and received the first Look Keo power pedals in Ireland despite all the naysayers (Garmin fans). Next is to fit them and start working with them. Congrats on the purchase! I've been using mine for quite a bit and love them. If you have any questions or anything don't hesitate to give us a shout! Thanks Mr T. Follow up fitting & first outing coming shortly. Cheers Chris. I've a couple of sessions under the belt and while definitely on a steep learning curve re power & application, the system is so simple to setup and use. Hopefully no need to twist your ear for help, but thanks for the offer!